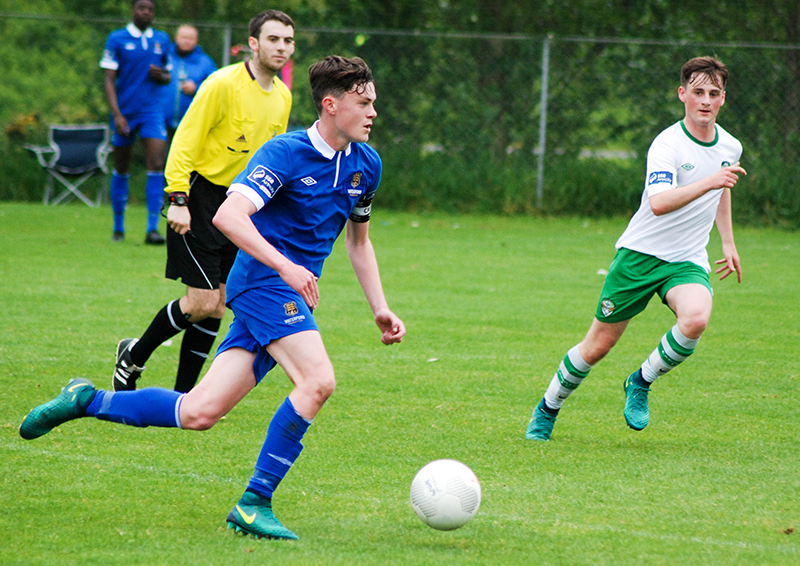 Waterford FC had to be happy with a point in the SSE Airtricity Under 17 Southern Elite Division for the second weekend running as the young Blues outfit played out a 1-1 draw with Dublin visitors Cabinteely played at rain lashed RSC on Saturday afternoon last. After going in front on 44 minutes through Lee Costello, the home side were pegged back just thirty seconds later when Kian Byrne headed home for Cabinteely before both sides had chances to win the game in the second half with the hosts missing a 78th minute penalty. Blues attacker Ciaran Brennan, who was called up to the Republic of Ireland Under 16 squad for the UEFA Development International tournament in Mayo next weekend, had the first chance on seven minutes but he fired over the bar after taken a pass from Colm Whelan. Waterford created another chance on 16 minutes when Colm Whelan sent over a corner kick from the left that Cabinteely defender Evan Caulfield sliced over his own bar before Whelan was denied by a smart Peter Quinlan save on 34 minutes after he raced onto a neat pass from Jack Larkin. With the Blues continuing to force the issue in search of a lead goal, they went close again on 41 minutes when Mike Nzongong took a pass from Regix Madika but he couldn’t keep his shot down as the ball flashed over the bar. The hosts did get their noses in front three minutes before half time when Dean Beresford got free down the left channel before having a shot cleared off the line by Cabinteely midfielder Sean McCann but Lee Costello was on hand to drill the rebound to the far corner of the net past Peter Quinlan. Cabinteely were back on level terms less than a minute later when Cian Kelly sent in a decent cross from the left that found the head of Kian Bolger and he beat keeper Ben Kirwan with a header from inside the penalty area for what was a disappointing goal for the Blues to concede. The second period of the game was played in monsoon like conditions with Jack Larkin heading a Colm Whelan left-wing corner kick over the bar on 53 minutes before the home side were awarded a penalty on 78 minutes when Regix Madika was fouled in the area but Jack Larkin saw his spot kick come back off the post. It was the woodwork that denied Cabinteely’s Joyce Tzunbu two minutes later as the visitors tried to capitalise on that miss before there was another real let off for the young Blues in the final minute of the tie when Clayton Walsh cracked in a shot from 25-yards that came crashing back off the crossbar with Ben Kirwan beaten. The men from Stradbrook had one final chance to win the game deep into injury time when Walsh took control of the ball on the edge of the penalty area but his effort was superbly tipped over the crossbar by Blues keeper Ben Kirwan.